Practicality is the foremost quality that businesses look for when in the market for effective marketing tools. 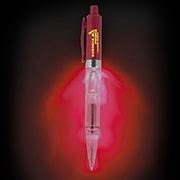 Nothing else is more useful than these promotional light-up pens. They are real eye catchers giving any brand the perfect medium to be displayed on. 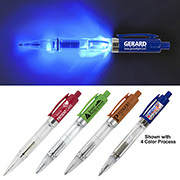 These branded light-up pens are also fun giveaways during company parties and other business events. Here at Innovation Line, we provide customers with best value choices. 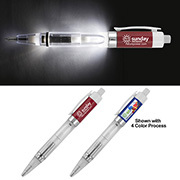 Our light-up pens feature a switch to activate the light and can be customised thru Spot Color or PhotoImage 4-color print process. Available barrels and light include blue and red. 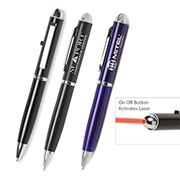 You know what is best for your customers when you choose Innovation Line as your online supplier of promotional merchandise. We have a large selection of quality merchandise to choose from all sold at the most competitive prices. Call us today and enjoy hassle-free shopping experience.